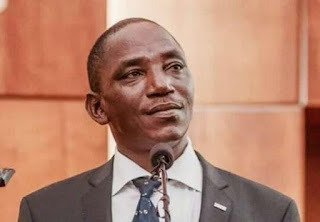 Youth and Sports Minister, Solomon Dalung has ordered that all the outstanding allowances of the Olympic Eagles be paid. The team has been running empty at the CAF U-23 African Cup of Nations in Senegal. They braved all the odds to beat hosts Senegal 1-0 on Wednesday, to qualify for the 2016 Olympic Games and also the final of the tournament. They will attempt to win the trophy Saturday evening, when they play against Algeria. Dalung, lamented the long suffering of team players and officials who throughout their camping and campaign in Senegal have not been paid a single dime. “This is an emergency problem we inherited. But I have directed the Permanent Secretary of the Ministry and the Director General Alhassan Yakmut to source for intervention funds to settle the players before this Saturday. “The players have done extremely well under the harsh situation, moreover a workman deserves his pay. We don’t want negative stories on non-payment of players’ allowances which are capable of tarnishing the image of the country. “I have pleaded with the coaches and players to remain focused on their final game billed for Saturday as all possible efforts are being put in by the Ministry to ensure that all outstanding bonuses and camp allowances are offset before Saturday” the minister said. He added that a team of National Sports Commission will be in Senegal to cheer the team to victory in their last game against Algeria.